The holidays are coming….and that means lots of baking! Do you know anyone who is gluten intolerant or has gluten allergies? Well, if you do, than you probably know how much they miss the everyday simple baked goods such as cookies, muffins, or bread. Imagine if you had to live without these favorite foods…. There are sooo many different kinds of gluten free flours out there. Bob’s Red Mill makes a great one, but they can get to be expensive. Sure, you could buy the already baked gluten free products, but they just don’t deliver the same home made taste. After many, and I mean many experiments with different gluten free flours and mixes, I’ve finally found one I love! The Cup 4 Cup flour blend made by Thomas Keller. It is sold at Williams Sonoma for a hefty price of $20 for a measly 3lb bag. As much baking as I do, that won’t last me long at all! So of course, I had to recreate this blend for my wallets sanity! I buy all my gluten free flours at Bob’s Red Mill in the bulk section. I love that place! We buy all types of gluten free flours there such as millet, coconut, tapioca, potato, sorghum, brown rice, white rice…..you name, they have it! They also carry gluten free noodles too. And buying in bulk saves me money that I can use on a pair of shoes instead! I use this blend in all my baking. Replace any flour in any recipe that calls for all purpose flour. I’ve used it in cookies, cakes, muffins, even my pie crusts…turns out great everytime! If you have ever baked with gluten free flours, you know they can be tricky. Breads can come out to gummy and cookies too dry. It’s more complicated than most baking I have found out. 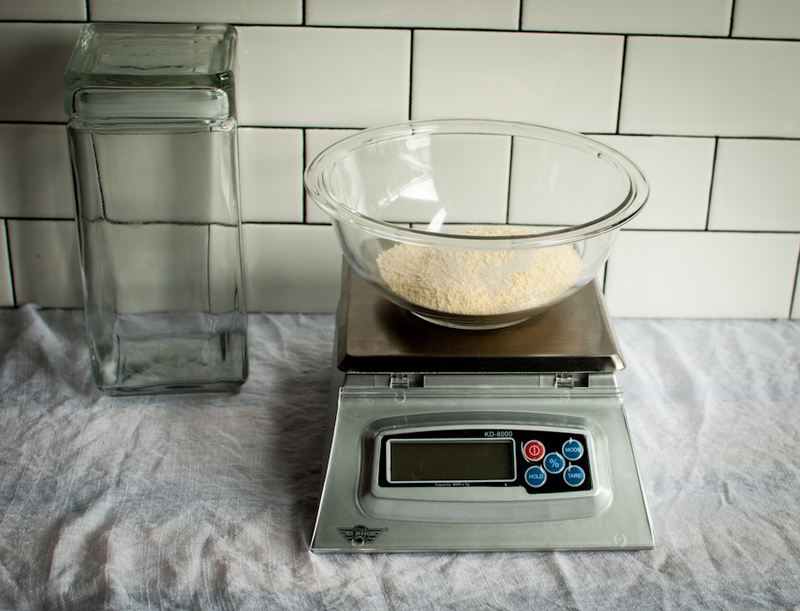 Ok…back to the gluten free flour mix, I use a scale to weigh out all my flours. It’s a must when making this mix. You can get one on Amazon for about $35. It weighs ingredients in lbs, oz, kilograms, and grams. It’s one of the best presents Andrew has bought me! 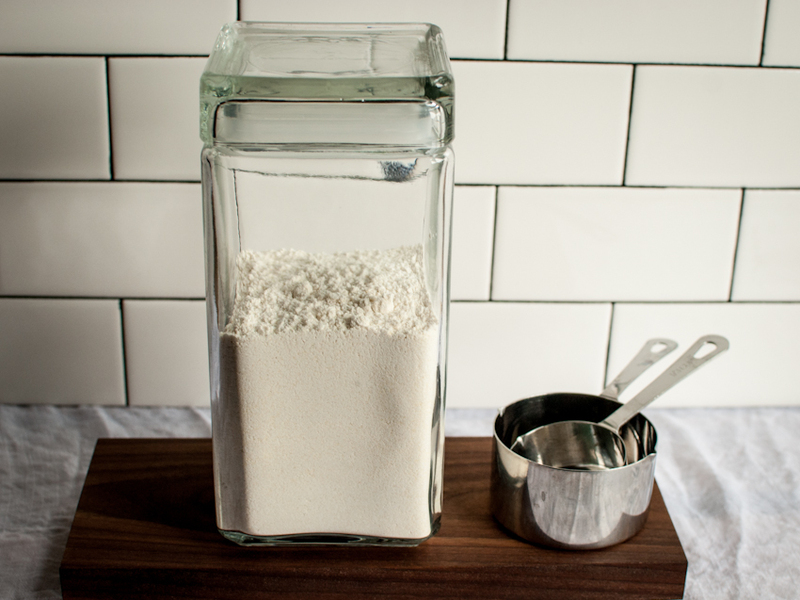 Simply weigh out all the ingredients and store the gluten free flour mix in a sealed container. For the same price you would pay for the Cup 4 Cup mix, you can get about 4 times the amount from this mix! To make the nonfat dry milk superfine, pulse in a food processor for about 10 pulses. Weigh all ingredients separately then combine in a large container and whisk together. Tip- whisk mixture before every use, some flours will settle to the bottom. Love that you are trying to find some sanity but still appreciate Thomas Keller’s GF flour blend- I’ve never used it, but now reading the kind of flours in it I am intrigued! Thank you for this post! I keep meaning to try more gluten-free flours but it does get SO expensive. I can’t wait to give this one a try! Mr. B’s sister is “everything intolerant” right now (or at least it seems like it) and anything that could cut down the expense is greatly appreciated! We will have to give this a try. Very interesting!! I’m grain-free so am excited to experiment with some coconut and almond flour recipes this holiday season. I have plans to convert a favorite cookie recipe to a Paleo version! I’m intimidated, so cool that you’ve found your perfect blend!